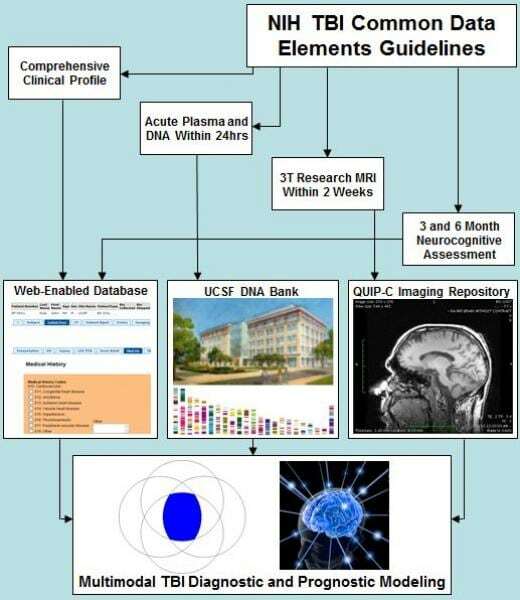 The global aim of this proposal is to test and refine Common Data Elements(CDEs), neuroimaging standards, and best practices for genetics and proteomics in Traumatic Brain Injury (TBI) studies. The investigators anticipate that this project has the potential to substantially advance and revolutionize clinical research in TBI. Repositories for neuroimaging, proteomic, and genetic biomarkers will facilitate the evolving field of these emerging technologies in TBI. 1. Clinical care, demographic and outcome data collection. 2. Blood draws for proteomic and genetic marker analyses. 3. 3T Magnetic Resonance Imaging will be completed on a subset of patients able to return 1-2 weeks post-injury. 4. Three month follow up. The Glasgow Outcome Scale - Extended (GOS-E) and neurological symptoms inventory will be administered to patients over the phone 3 months post-injury. Yue JK*, Winkler EA*, Sharma S, Vassar MJ, Ratcliff JJ, Korley FK, Seabury SA, Ferguson AR, Lingsma HF, Deng H, Meeuws S, Adeoye OM, Rick JW, Robinson CK, Duarte SM, Yuh EL, Mukherjee P, Dikmen SS, McAllister TW, Diaz-Arrastia R, Gordon WA, Valadka AB, Okonkwo DO, Manley GT; TRACK-TBI Investigators. Temporal profile of care following mild traumatic brain injury: Predictors of hospital admission, follow-up referral and six-month outcome. Brain Inj. 2017 Nov 22. Epub ahead of print. https://doi.org/10.1080/02699052.2017.1351000. 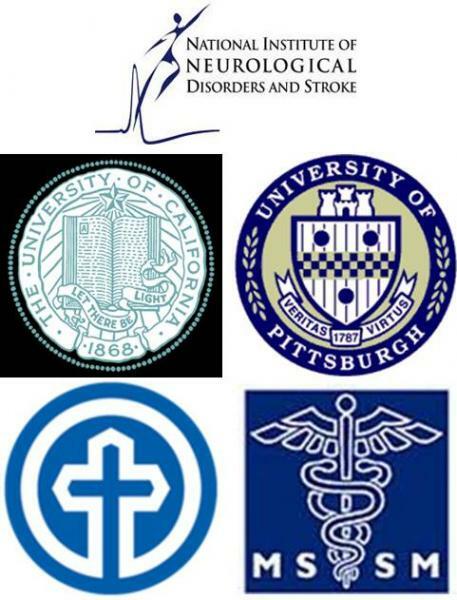 Pirracchio R, Yue JK, Manley GT, van der Laan MJ, Hubbard AE; TRACK-TBI Investigators. Collaborative targeted maximum likelihood estimation for variable importance measure: Illustration for functional outcome prediction in mild traumatic brain injuries. Stat Methods Med Res. 2016 Jun 29. Epub ahead of print. PMID 27363429. Wang KKW*, Yang Z*, Yue JK*, Zhang Z, Winkler EA, Puccio AM, Diaz-Arrastia R, Lingsma HF, Yuh EL, Mukherjee P, Valadka AB, Gordon WA, Okonkwo DO, Manley GT; TRACK-TBI Investigators. Plasma anti-glial fibrillary acidic protein autoantibody levels during the acute and chronic phases of traumatic brain injury – A Transforming Research and Clinical Knowledge in Traumatic Brain Injury Pilot study. J Neurotrauma. 2016 Jul 1;33(13):1270-1277. PMID 26560343. Korley FK, Diaz-Arrastia R, Wu AH, Yue JK, Manley GT, Sair HI, Van Eyk J, Everett AD; TRACK-TBI Investigators. Circulating brain-derived neurotrophic factor has diagnostic and prognostic value in traumatic brain injury. J Neurotrauma. 2016 Jan 15;33(2):215-225. PMID 26159676. Winkler EA*, Yue JK*, McAllister TW, Temkin NR, Oh SS, Burchard EG, Hu D, Ferguson AR, Lingsma HF, Burke JF, Sorani MD, Rosand J, Yuh EL, Barber J, Tarapore PE, Gardner RC, Sharma S, Satris GG, Eng C, Puccio AM, Wang KK, Mukherjee P, Valadka AB, Okonkwo DO, Diaz-Arrastia R, Manley GT; TRACK-TBI Investigators. COMT val (158) met polymorphism is associated with nonverbal cognition following mild traumatic brain injury. Neurogenetics. 2016 Jan;17(1):31-41. PMID 26576546. Yue JK*, Pronger AM*, Ferguson AR, Temkin NR, Sharma S, Rosand J, Sorani MD, McAllister TW, Barber J, Winkler EA, Burchard EG, Hu D, Lingsma HF, Cooper SR, Puccio AM, Okonkwo DO, Diaz-Arrastia R, Manley GT; COBRIT Investigators; TRACK-TBI Investigators. Association of a common genetic variant within ANKK1 with six-month cognitive performance after traumatic brain injury. Neurogenetics. 2015 Jul;16(3):169-180. PMID 25633559. McMahon PJ, Panczykowski DM, Yue JK, Puccio AM, Inoue T, Sorani MD, Lingsma HF, Maas AI, Valadka AB, Yuh EL, Mukherjee P, Manley GT, Okonkwo DO; TRACK-TBI Investigators. 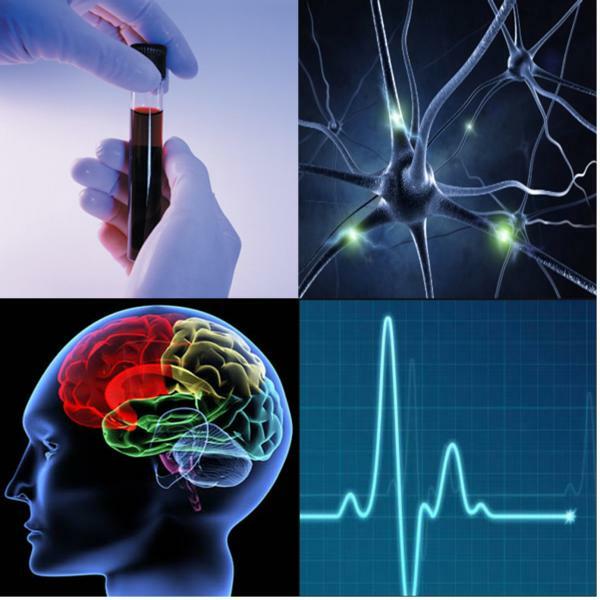 Measurement of the glial fibrillary acidic protein and its breakdown products GFAP-BDP biomarker for the detection of traumatic brain injury compared to computed tomography and magnetic resonance imaging. J Neurotrauma. 2015 Apr 15;32(8):527-533. PMID 25264814. Lingsma HF, Yue JK, Maas AI, Steyerberg EW, Manley GT; TRACK-TBI Investigators. Outcome prediction after mild and complicated mild traumatic brain injury: External validation of existing models and identification of new predictors using the TRACK-TBI pilot study. J Neurotrauma. 2015 Jan 15;32(2):83-94. PMID 25025611. Yuh EL, Cooper SR, Mukherjee P, Yue JK, Lingsma HF, Gordon WA, Valadka AB, Okonkwo DO, Schnyer DM, Vassar MJ, Maas AI, Manley GT; TRACK-TBI Investigators. Diffusion tensor imaging for outcome prediction in complicated and uncomplicated mild traumatic brain injury: A TRACK-TBI study. J Neurotrauma. 2014 Sep 1;31(17):1457-1477. PMID 24742275. Ratcliff JJ, Adeoye O, Lindsell CJ, Hart KW, Pancioli A, McMullan JT, Yue JK, Nishijima DK, Gordon WA, Valadka AB, Okonkwo DO, Lingsma HF, Maas AI, Manley GT; TRACK-TBI Investigators. Emergency department disposition of the GCS 13-15 traumatic brain injury patient: Analysis of the TRACK-TBI study. Am J Emergency Med. 2014 Aug;32(8):844-850. PMID 24857248. Diaz-Arrastia R, Wang KK, Papa L, Sorani MD, Yue JK, Puccio AM, McMahon PJ, Inoue T, Yuh EL, Lingsma HF, Maas AI, Valadka AB, Okonkwo DO, Manley GT; TRACK-TBI Investigators. Acute biomarkers of traumatic brain injury: Relationship between plasma levels of ubiquitin c-terminal hydrolase-L1 and glial fibrillary acidic protein. J Neurotrauma. 2014 Jan 1;31(1):19-25. PMID 23865516. Dams-O’Connor K, Spielman L, Singh A, Gordon WA, Lingsma HF, Maas AI, Manley GT, Mukherjee P, Okonkwo DO, Puccio AM, Schnyer DM, Valadka AB, Yue JK, Yuh EL; TRACK-TBI Investigators. The impact of previous traumatic brain injury on health and functioning: A TRACK-TBI study. J Neurotrauma. 2013 Dec 15;30(24):2014-2020. PMID 23924069. Yue JK, Vassar MJ, Lingsma HF, Cooper SR, Okonkwo DO, Valadka AB, Gordon WA, Maas AI, Mukherjee P, Yuh EL, Puccio AM, Schnyer DM, Manley GT; TRACK-TBI Investigators. Transforming research and clinical knowledge in traumatic brain injury pilot: Multicenter implementation of the common data elements for traumatic brain injury. J Neurotrauma. 2013 Nov 15;30(22):1831-1844. PMID 23815563. Okonkwo DO, Yue JK, Puccio AM, Panczykowski DM, Inoue T, McMahon PJ, Sorani MD, Yuh EL, Lingsma HF, Maas AI, Valadka AB, Manley GT; TRACK-TBI Investigators. GFAP-BDP as an acute diagnostic marker in traumatic brain injury: Results from the prospective Transforming Research and Clinical Knowledge in Traumatic Brain Injury Study. J Neurotrauma. 2013 Sep 1;30(17):1490-1497. PMID 23489259. Yuh EL, Mukherjee P, Lingsma HF, Yue JK, Ferguson AR, Gordon WA, Valadka AB, Schnyer DM, Okonkwo DO, Maas AI, Manley GT; TRACK-TBI Investigators. MRI improves 3-month outcome prediction in mild traumatic brain injury. Ann Neurol. 2013 Feb;73(2):224-235. PMID 23224915. Jagoda AS, Bazarian JJ, Bruns JJ Jr, Cantrill SV, Gean AD, Howard PK, Ghajar J, Riggio S, Wright DW, Wears RL, Bakshy A, Burgess P, Wald MM, Whitson RR. Clinical policy: neuroimaging and decisionmaking in adult mild traumatic brain injury in the acute setting. J Emerg Nurs. 2009 Apr;35(2):e5-40. Maas AI, Stocchetti N, Bullock R. Moderate and severe traumatic brain injury in adults. Lancet Neurol. 2008 Aug;7(8):728-41. Marmarou A, Lu J, Butcher I, McHugh GS, Mushkudiani NA, Murray GD, Steyerberg EW, Maas AI. IMPACT database of traumatic brain injury: design and description. J Neurotrauma. 2007 Feb;24(2):239-50. Marshall LF, Marshall SB, Klauber MR, Van Berkum Clark M, Eisenberg H, Jane JA, Luerssen TG, Marmarou A, Foulkes MA. The diagnosis of head injury requires a classification based on computed axial tomography. J Neurotrauma. 1992 Mar;9 Suppl 1:S287-92. MRC CRASH Trial Collaborators, Perel P, Arango M, Clayton T, Edwards P, Komolafe E, Poccock S, Roberts I, Shakur H, Steyerberg E, Yutthakasemsunt S. Predicting outcome after traumatic brain injury: practical prognostic models based on large cohort of international patients. BMJ. 2008 Feb 23;336(7641):425-9. Murray GD, Teasdale GM, Braakman R, Cohadon F, Dearden M, Iannotti F, Karimi A, Lapierre F, Maas A, Ohman J, Persson L, Servadei F, Stocchetti N, Trojanowski T, Unterberg A. The European Brain Injury Consortium survey of head injuries. Acta Neurochir (Wien). 1999;141(3):223-36. Niogi SN, Mukherjee P, Ghajar J, Johnson CE, Kolster R, Lee H, Suh M, Zimmerman RD, Manley GT, McCandliss BD. Structural dissociation of attentional control and memory in adults with and without mild traumatic brain injury. Brain. 2008 Dec;131(Pt 12):3209-21. Saatman KE, Duhaime AC, Bullock R, Maas AI, Valadka A, Manley GT; Workshop Scientific Team and Advisory Panel Members. Classification of traumatic brain injury for targeted therapies. J Neurotrauma. 2008 Jul;25(7):719-38. Steyerberg EW, Mushkudiani N, Perel P, Butcher I, Lu J, McHugh GS, Murray GD, Marmarou A, Roberts I, Habbema JD, Maas AI. Predicting outcome after traumatic brain injury: development and international validation of prognostic scores based on admission characteristics. PLoS Med. 2008 Aug 5;5(8):e165. Rusnak M, Janciak I, Majdan M, Wilbacher I, Mauritz W; Australian Severe TBI Study Investigators. Severe traumatic brain injury in Austria VI: effects of guideline-based management. Wien Klin Wochenschr. 2007 Feb;119(1-2):64-71. Wakana S, Caprihan A, Panzenboeck MM, Fallon JH, Perry M, Gollub RL, Hua K, Zhang J, Jiang H, Dubey P, Blitz A, van Zijl P, Mori S. Reproducibility of quantitative tractography methods applied to cerebral white matter. Neuroimage. 2007 Jul 1;36(3):630-44. Yuh EL, Gean AD, Manley GT, Callen AL, Wintermark M. Computer-aided assessment of head computed tomography (CT) studies in patients with suspected traumatic brain injury. J Neurotrauma. 2008 Oct;25(10):1163-72.